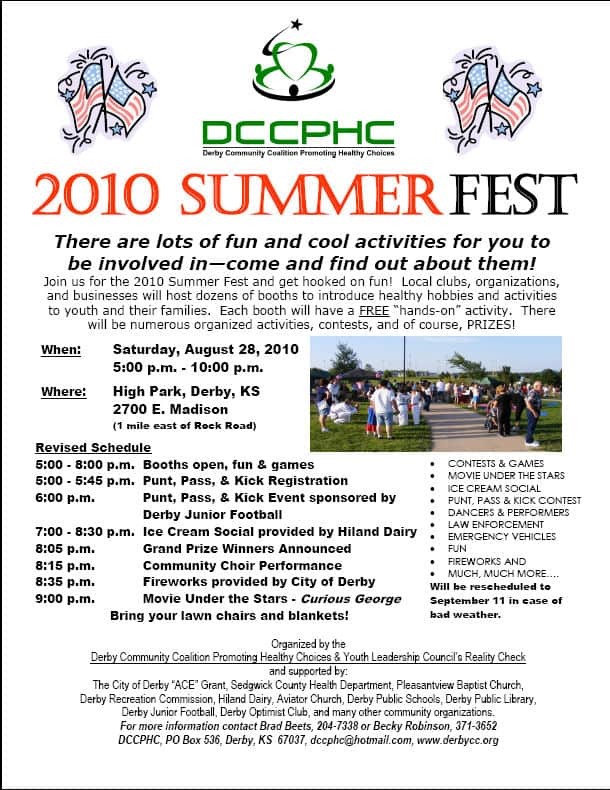 The Derby Summer Fest is a free event for the whole family with fun activities, an ice cream social, and a free Movie Under the Stars. What makes it even better is this year the festival will include the City of Derby fireworks show with a performance by the Derby Community Choir. (The fireworks had to be rescheduled because of rain on July 4th). Summer Fest begins at 5 p.m. at High Park, which is just east of Derby High School on Madison. The event is sponsored by the Derby Community Coalition Promoting Healthy Choices, and will feature games and contests at booths around the park. The booths will be staffed by volunteers from community businesses and organization and are designed to encourage kids’ interest in healthy hobbies and activities. This will be the fourth year that Summer Fest is host to the NFL Punt, Pass, and Kick Competition. Kids can register between 5 and 5:45 p.m. and the competition begins at 6 p.m.
Free ice cream will be available (while it lasts) beginning at 6:30 p.m. The patriotic choir performance will begin setting up at about 8 p.m. and is immediately followed by the fireworks. The free movie, Curious George, begins at 9 p.m.
To find out more about Summer Fest, visit the Derby Community Coalition website.